Whoa what got into Ariel Helwani? Due to Greg Hardy, is this some kind of Freaky Friday situation where the mind of Stephen A. Smith has hopped into the body of MMA’s most well known reporter? These Helwani Hot Takes™ have us thinking of a hypothetical situation. We hate hypothetical situations but we feel like this has a small chance of happening. What if Greg Hardy see the video below and puts his hands on Helwani during fight week? Would the UFC even fire Hardy over this? In this doomsday scenario, could the UFC laugh it off and push through on promoting Hardy? We don’t think there is a chance Greg Hardy watches First Take on ESPN or ever sees this video of Helwani putting him on blast. It would take folks repeatedly tagging Hardy on social media with a direct link to this post. MMA fans are known to be level headed and not complete fan boys for all things UFC, so that would never happen. Thank goodness for all parties involved. Helwani is known for being good on the mic and conducting all the interviews; ever. When it comes to opinion pieces/hot takes, Helwani is about exciting has a piece of white bread served alongside a glass of room temp water; no ice. Oh but not today (Jan. 16), not on ESPN First Take and not on the subject of former NFLer Greg Hardy. We all know the story of Hardy by now. Too violent for the NFL, caught on charges of repeated domestic violence towards women and pretty much blackballed from the league. The former star player was booted from the NFL and forced to take up a life as a regional MMA heavyweight. Welp, after a little over year of training, the UFC has already signed Hardy to deal and booked him on their first ESPN card. A very UFC thing to do. The move worked, because more people are talking about the event thanks to Hardy. To top it all off, Rachael Ostovich was a recent victim of a domestic violence and the UFC booked Hardy on the same card as her. Not cool. 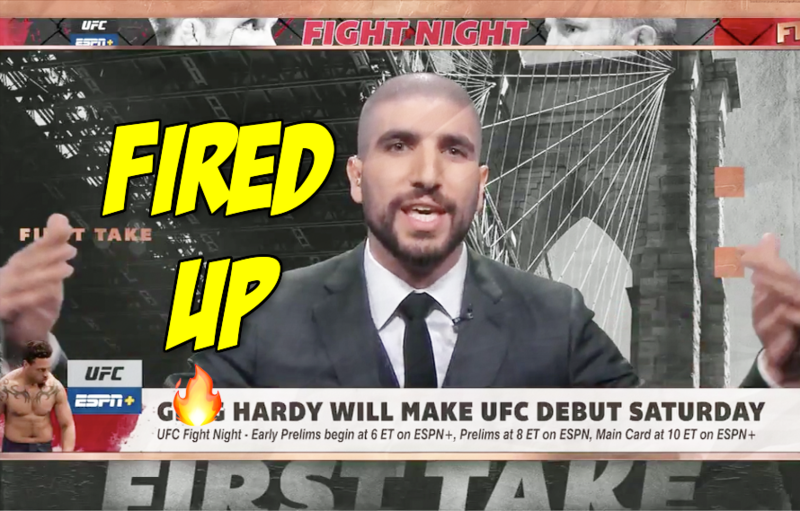 Ariel Helwani speaks for the people and he called the UFC tone-deaf for how they have promoted Hardy. Get yourself some Helwani. Highlights: Allen Crowder Defeats Greg Hardy (Disqualification)!